We are so close now we can feel it in the air. We are so tired now that it is hard to feel anything in the air. We are doing OK with living in our tiny 380 sq ft basement apartment. I have no regrets and certainly less stress since I am not living in town wondering about what is happening at the house. Since it has been ski season the only realistic place to rent is 6 miles south of our town and we are 7 miles west. The road makes a 90 degree turn in town so you get 12 miles each way if you give town a mile. Still, 380 square feet, even well laid out and comfortably furnished, is cozy for two adults and a dog. I do spend a lot of time upstairs working which reduces the impact of the tiny space but it still is a tiny space. Today I put the drawer hardware on the last two sets of drawers. I wanted to be elated not to have to fight with the not quite square with a template that was warped. Instead I took a nap: Right on the floor by my Jaw Stands. I had hunkered down to read the tiny numbers on the center post adjustment so I could level the posts. I was feeling kinda of woozy and sick. I thought to myself that I should just lie down and take a nap. A paint covered pair of clogs were a pillow. I woke up when one of the construction crew walked past me on the way down to get water for the rest of the crew. When I got up I did feel better for my nap. This evening my long-suffering spouse brought more screws from the hardware store. He hung around a bit then I noticed he was missing. I listened and then heard snoring coming from the bathroom. 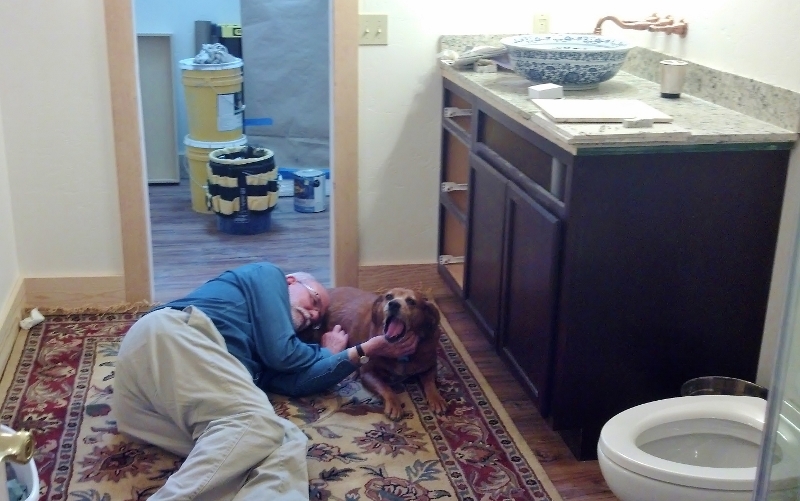 He and the dog were both dead to the world lying on the thick new rug in his bath. We used to think that waiting for a house was hard and it was. I have come to believe that it is hard to have a house and still be waiting. Hopefully it won’t be much be too much longer. Your comment makes me smile. I did not take a picture of him trying to walk after he got up. The first few steps looked pretty funny but I did not laugh…must not laugh….